The Indian armed forces are probably the only thoroughly professional government agency in the country. And among them, the marine commandoes are the elite – known for their lethality and uber professionalism, they are probably one of the elite forces in the whole world. 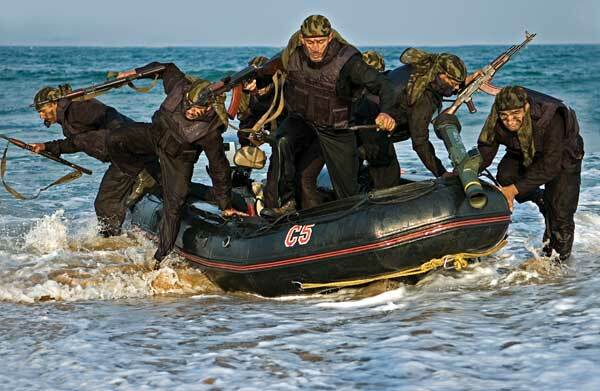 The Indian Navy’s elite special force, that specializes in everything from counterterrorism to underwater operations and sabotage to anti-piracy ops. Thanks to this wide field of operation, they have not only served on the high seas but also been called in during Op Vijay, better known as the Kargil War. Here’s what makes them the best in the world. 1.MARCOS were raised as the Indian Marine Special Forces (IMSF) in 1985. Two years later, they were renamed the Marine Commando Force (MCF). Their motto is – The Few The Fearless. 2. Becoming a MARCO or a Marine Commando is no cakewalk. Trainees have to undergo one of the world’s toughest courses that can last between two-and-a-half to three years, depending on the specialization. 3. Getting selected to be trained as a MARCO itself is difficult. The pre-training procedure, which includes a three-day physical fitness and aptitude test, sees almost 80% applicants being screened out. And it gets worse. A five-week-long ‘hell’s week’ follows this, which includes sleep deprivation and intense physical training. Those that make it through, or don’t quit on their own, actually proceed to the actual training. 4. Those that clear the selection then start undergoing the grilling course which includes basic training at INS Abhimanyu in Mumbai. The trainees then train in para jumps at the Paratrooper Training School in Agra and a diving course at Navy’s Diving School in Kochi. 5. After this basic training, they join – on probation – their respective groups for advanced training. This includes training for counterinsurgency, anti-hijacking, anti-piracy, clandestine operations, surveillance and reconnaissance, amphibious operations, unconventional warfare, and hostage rescue, among others. 6. All MARCOS are static line para jump qualified and some are qualified for Freefall (HALO/HAHO) para jumps – High Altitude Low Opening and High Altitude High Opening. In fact, MARCOS are the handful of the special forces from around the world that are capable of being para-dropped into the sea with the full combat load. 7. MARCOS are also trained in High Altitude Commando Course at the Parvat Ghatak School in Tawang, Arunachal Pradesh, at the Desert Warfare School in Rajasthan, High Altitude Warfare School (HAWS) in Sonmarg and Counter Insurgency and Jungle Warfare School (CIJWS) in Mizoram. 8. Their training makes MARCOS tough nuts to crack. An Indian MARCO on an exchange program in the US topped the US Navy SEAL course with ease. 9. After completion of training, a MARCO serves with the elite outfit for 3 to 5 years. 10. The MARCOS are equipped with some of the best weapons in the world. The units are equipped with the Israeli Tavor TAR-21 assault rifle to which a 40 mm grenade launcher can be attached. The TAR-21 is weather sealed so a MARCO can emerge out of the sea, weapon drawn and ready to shoot. A scary sight for the bad guys! 11. Other weapons include the Heckler & Koch MP5 submachine gun for close quarter battles, the SIG Sauer P226 and Glock 17 pistols and the Druganov and Galil sniper rifles and OSV-96 semi-auto heavy caliber anti-material rifle. Apart from the weapons, they also operate two-man subs, the Italian CE-2F/X100, for conducting covert underwater operations. 12. The MARCOS operations are the stuff of legends. Op Pawan in Sri Lanka, an operation to blow up the Jaffna jetty, saw MARCOS swim 12 km to their target with their combat load in tow. They then slipped in without being detected and blew up the harbor with explosives. They were immediately fired upon by the LTTE. The commandos returned fire and managed to swim back to the ship without any casualties. 13. In 1988, the MARCOS, as a part of Op Cactus, thwarted an attempted coup in Maldives. They captured the boat with 46 mercenaries and their hostages that had escaped after the failed coup attempt. 14. During the Kargil War, the MARCOS were tasked to undertake covert operations behind enemy lines. During the Mumbai attacks in 2008, they stormed the Oberoi Trident and Taj hotels where the terrorists were killed. 15. Even the terrorists in Kashmir are scared of the MARCOS and refer to them as ‘Dadiwala Fauj’, thanks to the beards they wear as a disguise.